The Police have dismissed the trigger-happy mobile policeman who shot former House of Representatives member Hon. Opeyemi Bamidele and five other party faithful last Friday. The culprit opened fire at the All Progressives Congress (APC) secretariat during the welcome rally held for the governorship flag bearer, Dr. Kayode Fayemi. Bamidele and five other injured party members were hospitalised. But, the former federal lawmaker has been relocated to Lagos for post-surgery treatment. The officer was battered by angry party members who smashed his head, inflicted injuries on him and dispossessed him of his service rifle. Ekiti State Commissioner of Police Mr. Bello Ahmed disclosed that the mobile policeman has been dismissed from service to pave the way for his trial in court as soon as he is discharged from the hospital. 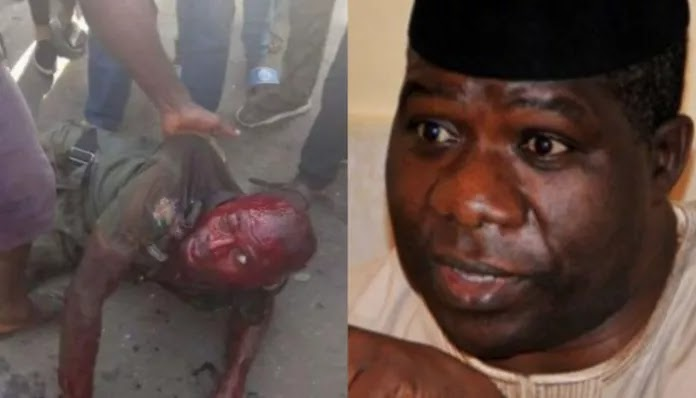 The police boss who spoke on a live programme on Channels Television said that the politician who brought the policeman to Ekiti State from his Lagos base has been detained and he is being grilled by interrogators. Ahmed said the politician will also be arraigned in court as soon as the Police conclude their investigation into the shooting incident. He said: “The policeman involved is dismissed already and even though he’s nursing some injury. “At the appropriate time, he will face the law of course. Nigerians will be briefed on the outcome of our actions.” Ahmed also spoke on the readiness of the command to regulate the activities of political parties to prevent violence and other acts that could lead to a breakdown of law and order.